Greetings, Underworld Ascendant players. Welcome to The Stygian Abyss! 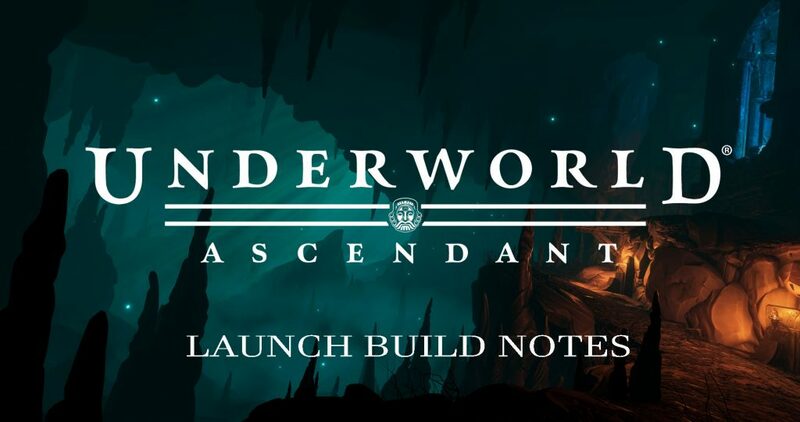 Underworld Ascendant is now live. We are so excited to reach this momentous occasion and to share Underworld Ascendant with the world. We look forward to seeing how each of you approaches the many enemies and obstacles that stand in your way. – Please note that you cannot “save your game” while in the Abyss. It only preserves your inventory, skills, and day progression. You can only “hard save” in Marcaul / the hub. The Silver Sapling is used as a respawn point within a level. – Russian text previously displayed missing text as blocks. This has been fixed. – Subtitles were added in the intro sequence for certain languages (French, Chinese, etc). – Partial French VO has been removed. – Faction Influences have been adjusted so more is gained from Side Bounties and the total required to unite the factions is lower. – Item names and descriptions have been updated in Japanese. – Additional monitor aspect ratio support added, like 21:9 (note that the UI may stretch in certain areas). – Player spellbook entries are preserved between levels. – Fixed issue where a pile of items incorrectly spawned at the start of some levels. – Player sound effects removed between loading screens. – In-Game Language choice preserved between play sessions. (Note that the Graffiti on walls will remain in the original language until you enter a new level). – MAGIC FIST spell now visibly causes an impact reaction on enemies. – PENDING: reported crashes when loading into Pluto’s Gate. – PENDING: add option to remove or reduce mouse smoothing. – Changing the graphics settings during a mission will reset you back to Marcaul (the hub) and progress the day by 1. – Dead NPCs may tug into the wall when you are a certain distance away. – Player Hunger level can increase when game is paused. – Some metal doors can get stuck in their frame when opened. – Some audio might overlap when you play a Memora log during narration. – Highlighting over the companion mind crippler shows additional outlines. This creature still behaves per normal. – There are rare areas where a skeleton would spawn in an unexpected area and not react to players. – Character punches the air after casting a spell with a wand. – Selecting sounds in the character customizer does not show box around the selected option. – If character falls into Valley in Titan’s Reach and has all the movement skills unlocked, they can survive the fall and become stuck. – In Tyball’s Folly, falling into water in the Necromanteion region causes players to be stuck. – Playing on the computer with a controller, exiting the game, rebooting the computer and starting up the game causes the game to be locked to playing a controller. You will need to replug the controller and reset the controls. – Corpses of Deep Slugs occasionally distort after reloading a level. – Thrown objects will pass through Aelita. – In one room in Murgo’s Prison some items will disappear after turning off a trap. – If you are climbing a chain while being hit by a Ripper, you are unable to get off the chain. – Some chains move on their own. – If an additional game is loaded while in-game, the faction favor could display inaccurate information. – Wooden chairs can sink in water. – Some items might be hard to see if they drop on soil. – Faction bonus popups add an extra “the” in front of the faction’s name. – Splashing into shallow water sounds like splashing into deep pools of water. – URUZ rune icon is different in spellwheel than in spellbook. This is a font issue. – Using Controller on OPTIONS menus that scroll, you need to use the right stick to scroll the menus. – There are some holes in the environments that are being addressed. – Formatting issues with some text with the quest tab, reward screen and subtitles. – Some fighting animations with a sword can miss collision with Rogue Outcast. – Text Formatting with Hints is inconsistent. – Changing Language settings does not adjust Graffiti text’s language. Purchase the game week 1 to receive In-Game Bonus Items as well as 15% off of the retail price for the game. Offer expires 21 November, 2018 (9:59am PST). Retrieve the quest companions through the “Player Stash” in the Midnight Forum (near Aelita) in Marcaul. The Player Stash has a map icon to help you find it. When you open your stash, you get an auxiliary inventory UI and you will see the items in there. You can drag them to your regular inventory and equip them from there (there’s 1 special slot for equipping a companion, just like armor, etc.). Note: every new character the player creates will have those items sitting in their stash. You will also be able to access the folder from via the Steam library by right clicking the game, selecting Properties, Local Files tab, then select the Browse Local Files button. Do I need to know anything about the games this is based on? This game seems… really hard… I can’t kill anything! If you spam light attacks too often, enemies will start to block more often. You need to vary your attacks. Your weapons have durability, and not just from attacking! Defending / parrying too many shots can weaken your gear. Peek at the skill tree and play around with different setups! If you want to be more mobile, you may want to invest in the “Fighter” tree just for some mobility options. If you want to utilize more magic to give yourself more options, try out the “Magic” tree. And of course, if you’d like to go FULL “Garrett,” there’s always the “Stealth” tree. Be sure to join the Steam Discussions or Discord to share your experiences! I’m a Kickstarter Backer! How do I redeem my Steam key? NOTE: Whether you selected Steam or DRM-free for your final game key, ALL backers are receiving a Steam key. The game is still DRM-free (you can play offline or without launching the Steam client). We are still looking into non-Steam platform alternatives such as on itch.io / GOG . When I load up Underworld Ascendant, it doesn’t play, and I was able to play the Backer Pre-Alpha / Alpha / Beta just fine! Make sure to delete your save files from the previous builds before playing Underworld Ascendant. You can find your save files under My Documents/My Games/Underworld Ascendant. I received an email from BackerKit that my address was needed to complete my order, but I only have digital rewards. You can ignore this email! This is usually if you ordered Prototype Access and BackerKit assigned you a second pledge and it notices your address was left empty. Your launch key and rewards will NOT affected. My game crashed! How do I send you a bug report? I’m waiting for my / Mac / Linux key. When should I expect it? We expect the Mac and Linux builds to be finished after launch. We will continue to update you on our progress as we work on these versions of the game. For the DRM-free version of the game, we are still searching for a vendor. We apologize for this inconvenience. If you would like to use your Steam key in the meantime, it is is DRM-free and can be played completely offline and without launching Steam. We will update everyone when we have our DRM-Free distribution channel finalized. Does this game support 21:9 or ultrawide monitors?